The Franklin Park Conservatory, in Columbus Ohio, has many gardens. The paths through the campus lead you through culinary, herb and fragrance gardens. The rose garden is not to be missed on any visit and sufficient wanderings will take you past 40 community garden plots. These cuff down socks were inspired by a walk through the Conservatory, with cables and texture for the paths I walked and lace leaves for the plants. Knit cuff down with a heel flap they include three charts and enough interest to keep the most fickle of knitters (me!) interested from cuff to toe. The pattern stitches in these socks are charted only, no line by line instructions are given. Notions: Cable needle, large eyed tapestry needle for grafting toes. 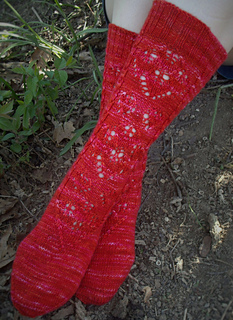 Unplanned Peacock Studio’s Twisty Sock can be purchased through their website.